Colin Kaepernick appears to be warming to the idea of staying in San Francisco. While it’s uncertain if that’s in John Lynch and Kyle Shanahan‘s plans at this juncture, the 29-year-old quarterback reached out to Lynch. Kaepernick and the new 49ers GM plan to meet soon, Lynch said Thursday (via Eric Branch of the San Francisco Chronicle). Shanahan said he will evaluate Kaepernick on film in the coming weeks. Many other signal-callers, like Kirk Cousins or Jimmy Garoppolo, have been linked to the 49ers in recent weeks, and the team can save $16.9MM by cutting Kaepernick. Previously believed to be opting out, Kaepernick is now in wait-and-see mode, joining the new-look 49ers in that regard. He’s the only quarterback under contract with the 49ers for 2017, even if that contract is not exactly binding. Here’s more coming out of San Francisco. One of the many players placed on IR during the 49ers’ 2-14 season, Eric Reid looks to be on track to return by OTAs, Nick Wagoner of ESPN.com reports. Reid tore a biceps tendon in late November but told Wagoner a doctor informed him if there was a game this week he would be able to practice. Entering his fifth season, the safety will make $5.676MM as part of the fifth-year option the team exercised. Lynch does not have a known preference on what kind of defensive scheme he wants the team to utilize. He said (via Nick Wagoner, on Twitter) he’s talked with DC options with backgrounds in multiple fronts. Former Jaguars linebackers coach Robert Saleh, current Patriots ‘backers boss Brian Flores and Falcons passing game coordinator Jerome Henderson are known options thus far. The 49ers have long used a 3-4 alignment, but most of the players from their early-2010s defensively geared run are no longer on the team. That said, 5-technique ends Arik Armstead and DeForest Buckner arrived as first-round investments the past two years. New 49ers head coach Kyle Shanahan will likely call the offensive plays in San Francisco, according to Ian Rapoport of NFL.com (Twitter link). 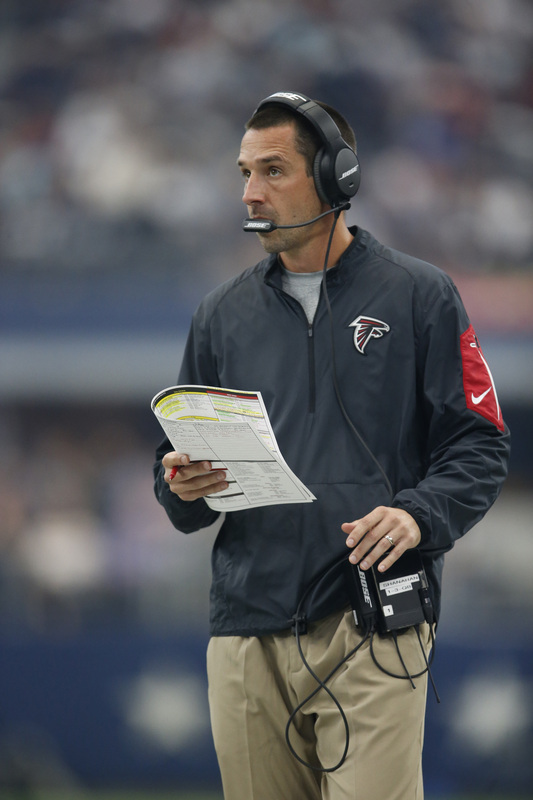 Additionally, Shanahan is expected to hire former Falcons assistant Mike McDaniel as a run game coordinator and Wagner College offensive coordinator (and former Falcons staffer) Rich Scangarello as quarterbacks coach, per Rapoport. Ex-Atlanta running backs coach Bobby Turner is also headed to San Francisco, tweets Gil Brandt of NFL.com. Given that the 49ers aren’t expected to hire a formal offensive coordinator, San Francisco will head into the 2017 campaign with inexperience infecting many areas of the club’s structure. New general manger John Lynch has never worked in an NFL front office, while Shanahan is not only a first-time head coach, but will act as his own OC and lean on a QBs coach in Scangarello whose most recent coaching experience comes at an FCS school. In addition, Shanahan will oversee some of the club’s personnel aspects, as he’ll exert control over the 49ers’ 53-man roster. As for the rest of San Francisco’s coaching staff, Shanahan is reportedly interested in hiring co-defensive coordinators, with Atlanta passing game coordinator Jerome Henderson and former Jaguars linebackers coach Robert Saleh emerging as the most likely candidates for the positions. On offense, the 49ers still want to keep former RBs coach Tom Rathman on staff in some capacity even after adding Turner, tweets Matt Maiocco of CSNBayArea.com. 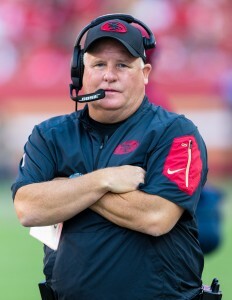 Just over a week after the Falcons expressed interest in having Chip Kelly become their next offensive coordinator, the former Eagles and 49ers head coach has emerged as a “legitimate candidate” to land the role, reports Jeff Schultz of the Atlanta Journal-Constitution. Kelly would take over for Kyle Shanahan, who will replace Kelly as the 49ers’ head coach after the Falcons take on the Patriots in Super Bowl LI this Sunday. The fact that there aren’t any other proven offensive coordinator candidates on the market makes Kelly a viable option for Atlanta, Schultz notes. Long an offensive guru, the 53-year-old Kelly would inherit an enviable collection of talent in Atlanta, whose attack has laid waste to opposing defenses this season. The Matt Ryan-, Julio Jones– and Devonta Freeman-led unit topped the NFL in both scoring and DVOA during the regular season, and it has combined for 78 points in playoff wins over the Seahawks and Packers. Kelly is known for running a fast-paced offense, which helped lead to his downfall in both Philadelphia and San Francisco, but the ex-Oregon head coach’s NFL failures have “humbled” him, according to Schultz. As a result, Kelly is willing to slow things down, which he’d have to do in order to accommodate the Falcons’ offensive weapons and make life easier on the team’s defense. Shanahan, meanwhile, won’t be able to take any significant members of head coach Dan Quinn‘s staff with him to San Francisco. The Falcons will prevent him from pilfering the likes of assistant head coach/wide receivers coach Raheem Morris, running backs coach Bobby Turner and offensive line coach Chris Morgan, a source told Schultz. However, offensive assistants Mike McDaniel, Mike LaFleur and Matt LaFleur could end up with Shanahan’s 49ers.